Not all adventures of cuisine are good. You remember China. Now let me tell you about Laos. 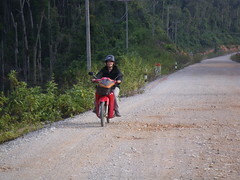 The last night of our motor-bike adventure we stayed at a local homestay near the Konglor Caves. I have no idea how this got set up, but there seems to be some sort of local cooperative running a homestay program- tourists just show up at the boat dock and ask for a homestay. 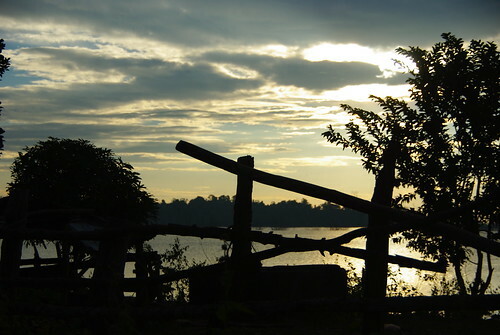 Laos maintains most of its cultural traditions and signs all over the country instruct tourists on acceptable behavior. 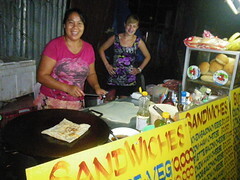 We were interested in finding out what it was like to be in a traditional Laos home and of course the food. Dinner was served on a special metal tray and it was clear from the get-go that we were being treated as honored guests. 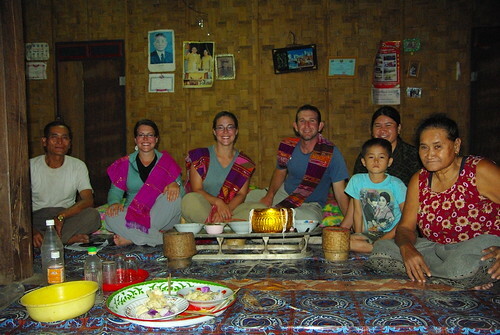 The family was wonderful to us and having read up on Laos table manners and customs we were pretty confident we’d impress them or at least not make any serious faux-pas that would send our hosts over the edge. 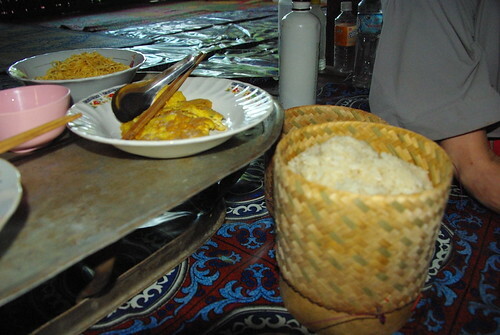 Baskets of rice, bowls of unidentifiable stews and vegetables were laid out in front of us. Digging in, my first bite wasn’t so rewarding. In fact it was awful. A blended grizzle of meat, bones and definitely organs, the cold meat stew-like dish tasted like rotten dirt and made me want to vomit in my mouth. Grabbing a handful of rice, which interestingly enough they roll in a ball and dip just like African’s do with n’sima, I tried to get it down. Trying desperately to swallow as my eyes watered and my natural gag reflex kicked in, I was horrified that I might actually spit out the food. Pretending to pick bones out of my mouth, I got most of it down or on the plate without incident. In fact I did so well that Danny didn’t even notice my choking, gagging or watery eyes. Needless to say, I was hesitant to go for the veggies, but with the grandfather pushing the plate at me over and over again there was nothing I could do but dip my ball of rice in. This time it wasn’t so bad and although it was far from delicious I got a few soaked rice balls down. Becka somehow got through the meal without touching the “cold brown meat sludge.” Danny wasn’t so fortunate and since he missed my theatrics he also succumb to our hosts and tried it. Fortunately he was more cautious than I was and only dipped a small bit of rice in the sludge before declaring himself full. 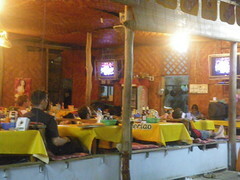 We’d been warned for months about Vang Vieng, a mecca for party-hard backpackers in Laos- complete with restaurants offering “happy” menus of drug spiked food and drinks. Two other bloggers told us that despite the awful things we’d heard it was a not miss and so we decided to chance it. After being completely disappointed with four thousand islands were were hesitant. With a wish and a prayer, we headed to Vang Vieng and somewhere between Britney Spears’ greatest hits and Jameraquai we found a reason to stay. Nestled in the mountains, Vang Vieng has become a town with two faces, the party-hard scene and the adventure tourism scene. For sure these two don’t normally mix, and as we walked down the street I was shocked at the number of backpackers staring blankly at Friends re-runs on restaurant TV’s. Annoyed, my mood didn’t change until we were sitting in out hotel room overlooking the river. The charm of the place began to grow on me and by the time we were rock climbing the next morning after a great night of sleep, some delicious western food and numerous fruit smoothies I was sold. 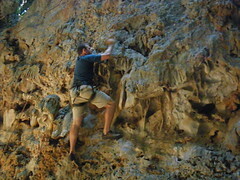 We spent a day mountain biking to various limestone caves in the surrounding hills. 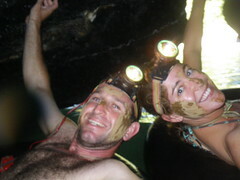 For sure they are heavily backpacked, but it was lovely floating through the underground river on a tube, that was until navy crawling through the cave I came face-to-face with a large brown spider. “Not dangerous, right?” I asked our guide in pigdin English. “heheh,” he replied. Thankfully there were no other suspicious creatures in the other caves. It was sunset by the time we got to the “blue lagoon” cave. Up the steep cliff side of a mountain, the cave itself is actually home to a gold reclining buddha. Although there were a few other late afternoon tourists with us, it was really amazing to look up from the bottom of the cave to see the buddha on his platform with a small sliver of late afternoon sun. By the time we left we were the only tourists left on the site, which proved to be a problem because Danny had blown out his bike tire. Hitching a ride back to town in the dark was actually rather easy. The hard part was mountain biking back in the dark. Major kudos to Becka for attempting something she hates, at night, in the dark. It is easy to see the negative impact of tourism in town. 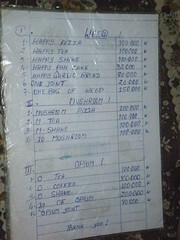 Sitting down to dinner one night we were presented with the “happy menu” of all sorts of food and drink that could be made with marijuana, mushrooms and opium. Never seen that before! Bar after bar has theater style seating facing televisions that play reruns of friends and family guy seemingly 24/7. It’s not pretty. 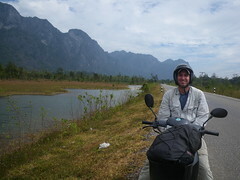 The long and the short of it was that Vang Vieng way exceeded our expectations. We were sad to go after only three days and with the ridiculously cheap and delicious fruit smoothies, fresh stuffed crepes and baguette sandwiches not to mention gorgeous scenery and good activities we could have stayed much longer despite the “happy” meals and reruns. Some of our best memories this entire trip have been when we’ve had our own transportation. The first time was in our final days of Argentina when we shared a rental with some other travelers we met at our guesthouse. Next was Africa where we rented our own car to tour Southern Africa, taking it into 4 different countries, before heading north and meeting up with some others driving their own car back to London. Those were all cars. Two wheels are far better than four. 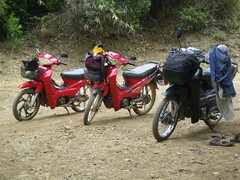 We arrived to Tha Kheck after a long day on yet another slow bus in Laos and made our bookings for the motor bikes. Mr. Kho started us out with a basic lesson which involved us turning the bikes on, driving and switching from first to second gear, and making u-turns. The turns were actually actually the hardest part because going to slow means the bike falls down on you…and that hurts. We were off, zooming down the highway….well it was a road. The first stop was one of the reasons we wanted to do the loop, the Buddha Cave. This particular cave was only discovered in 2004, filled with Buddha statues that hadn’t seen the light of day for as many as 600 years. It is believed they were hidden in the cave from invading forces from modern day Thailand, who now make religious pilgrimages to the site. The next day was where we earned our racing stripes. 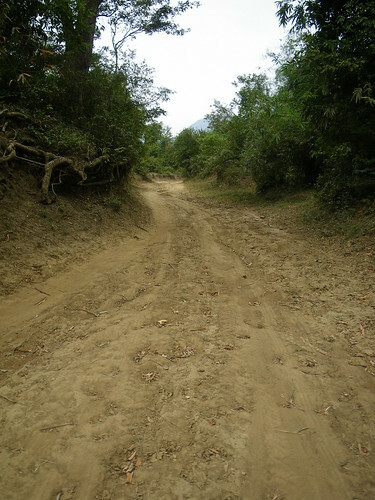 The road had gone from paved to unpaved to dirt and then finally to mud. Becka’s bike liked to stall every time she slowed to a stop or tried to downshift while going uphill, this led to her constantly jumping on the starter to get the bike going again and thanks to her small legs she had more than one bruise to show for it. Jill though was even worse. On the main rough patch she lost control of her bike and although she was still on the bike, it was spinning out of control, in circles, through the mud. Rather than using the break she instinctively pulled on the accelerator which kept her bike doing Evil-Kanivel 360s with the weight of the bike falling against on half of her body. This was after she’d taken a spin (not literally) through a thorn patch and had thorns through all her toes. Somehow I survived without the same bruises and scrapes. I also got to play hero when Jill’s fuel intake came out and I managed to both find and fix the problem….skills I owe to when it happened to us in Ethiopia. Clearly I’m the hero of this story! 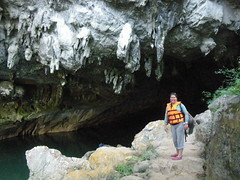 Our motorbike tour wouldn’t be complete though without our final stop at the Konglor Caves. Arriving to the caves in the morning we traded in our bikes for a boat (and boatmen) to take us through several kilometers of subterranean rapids until we emerged on the other side of the mountain. It was a spectacular river but didn’t compare to the fun we had riding those bikes!